Melissa Courtney is all smiles after her run in Germany. Pic: IAAF. Melissa Courtney shattered the Welsh 3000m record as she powered to victory in a world-leading time in Germany. Wales’ Commonwealth Games 1500m bronze medallist clocked eight minutes 43.36 secs in Karlsruhe. 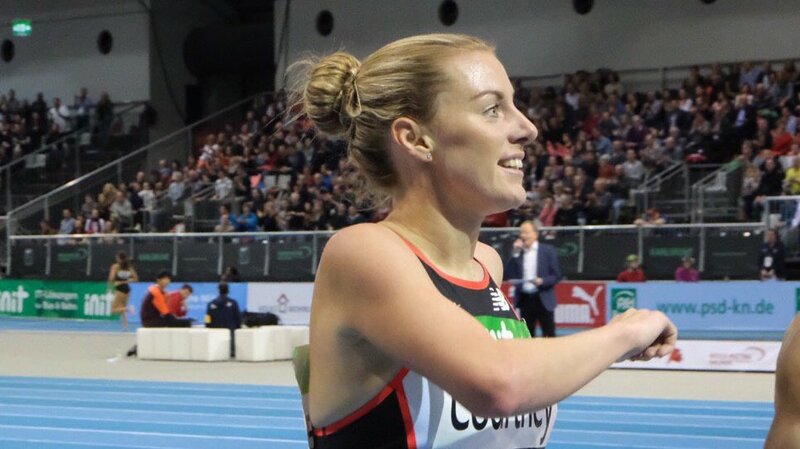 Courtney took more than 10 seconds off her previous best to leap from 19th to eighth on the UK all-time list. And her time took two secs off the Welsh record set by Hayley Tullett at a meeting in Lisbon nearly 18 years ago. The Poole AC runner was competing in her first race of the year having just returned from a training camp in Kenya. And she is clearly determined to follow-on from her exploits last year which included that bronze at the Commonwealths in Australia. Courtney ran a 29.43 last lap as she triumphed ahead of Ethiopia’s Alemaz Samuel (8:43.78) with Gudaf Tsegay third in 8:46.27.